Left: "Atlantic Mutual Insurance Co.'s Building" --A Short Historical Sketch of the Atlantic Mutual Insurance Co. 1842-1901, pg. 20. Collection of The Skyscraper Museum. Right: "Trust Co. of America" --King's Views of NY, 1908-1909, pg. 27. Collection of The Skyscraper Museum. 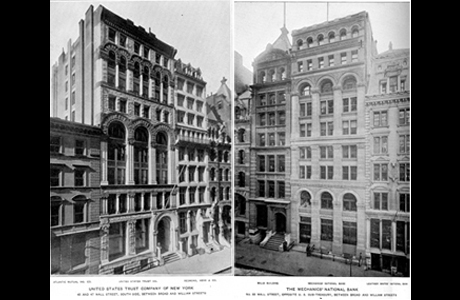 Around 1900, several new buildings on Wall Street broke through the ten- to twelve-story standard of the high-rises of the 1880s and 1890s. On the block between Broad and William streets were the 18-story building of the Atlantic Mutual Insurance Co. at 45 Wall, completed in 1901, which replaced that company's 5-story headquarters built in the 1850s, and the 25-story Trust Co. of America Building of 1907, designed by Francis H. Kimball, at 37 Wall that rose 327 ft. on a lot fronting only 99 ft. In this period before any zoning law regulated shape or height, these buildings rose straight up above their lot lines. 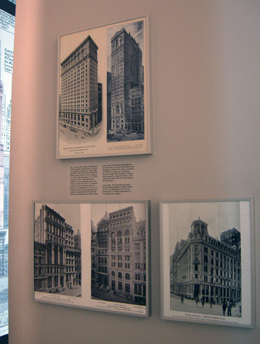 Views of the block photographed in the 1890s show, at left, the United States Trust Building by architect R.W. 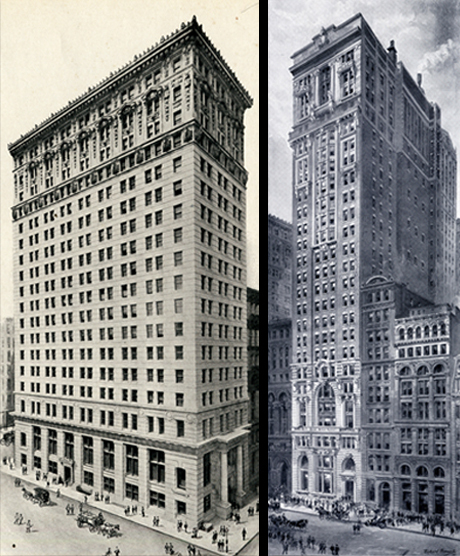 Gibson, completed in 1888/9 and, at right, the contemporary three-arch fa�ade of the Mechanics' National Bank designed by Charles W. Clinton, which replaced the earlier bank of the same name by Richard Upjohn. Right: "The Mechanics' National Bank" --King's Views of NYSE 1897-1898, pg. 56. Collection of The Skyscraper Museum. "Drexel Building: J. Pierpont Morgan & Co." --King's Views of NYSE 1897-1898, pg. 42. Collection of The Skyscraper Museum. 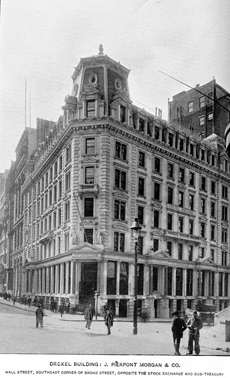 The elegant Second Empire Drexel Building designed by Arthur Gillman in 1873, was demolished in 1913 for the monumental J. P. Morgan headquarters by Trowbridge and Livingston.